Isabella Alden taught Sunday school for decades. It was one of her favorite things to do, and she was widely considered to be an expert in the field of teaching very young children about the Bible. 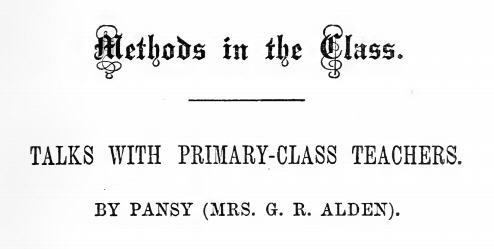 A chapter heading from the book “How to Teach the Little Folks” by J. Bennet Tyler, 1875. Her favorite age-group to teach was what she called the “infant class”—children who were not yet old enough to read, or were just beginning to read. She wrote many articles and regularly conducted classes on how to teach children about the Bible and God’s promise of salvation through Christ. From the book “Chautauqua: Historical and Descriptive,” 1884. While that may have been her ideal Sunday school classroom, the truth was that Isabella often taught her little students over the vestibule of a dingy old church. 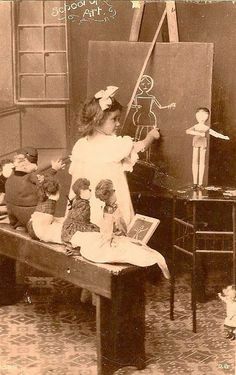 Instead of ornamental pictures on the walls, more often than not she had to use pictures cut out of a Bible dictionary to help illustrate her lesson, and a broken slate for a blackboard. Once Isabella had the physical location of her Sunday school under control, she was free to concentrate on teaching her little ones. 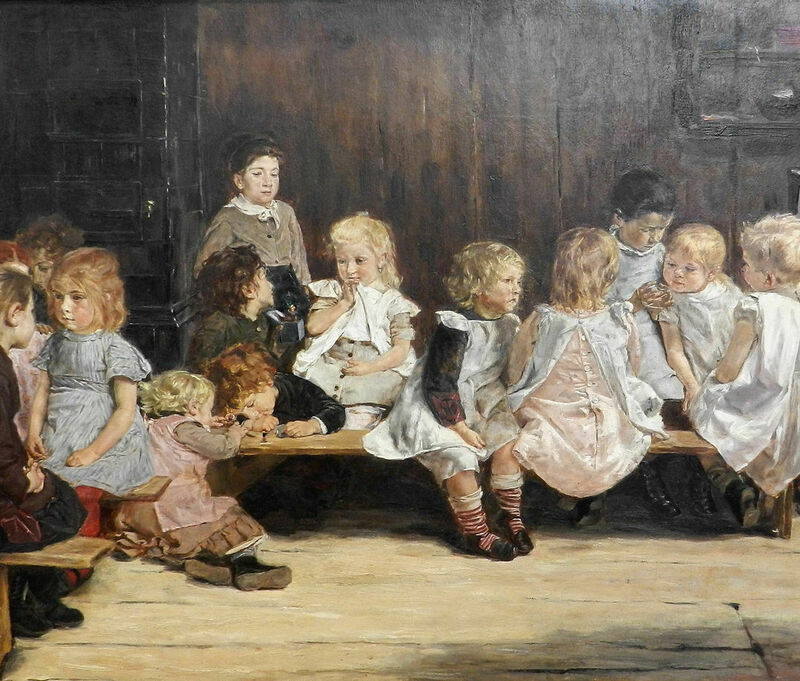 The Kindergarten Class, by Max Lieberman, 1880. When she was just starting out, she once had a class that began very badly. The wee ones were afraid to even whisper, and she could not coax them to repeat their verses no matter how hard she tried. When she tried to talk to each little scholar individually, they were so frightened, they began to cry. Clearly, there was no point in trying to coax them into singing a little hymn. So what did Isabella do? 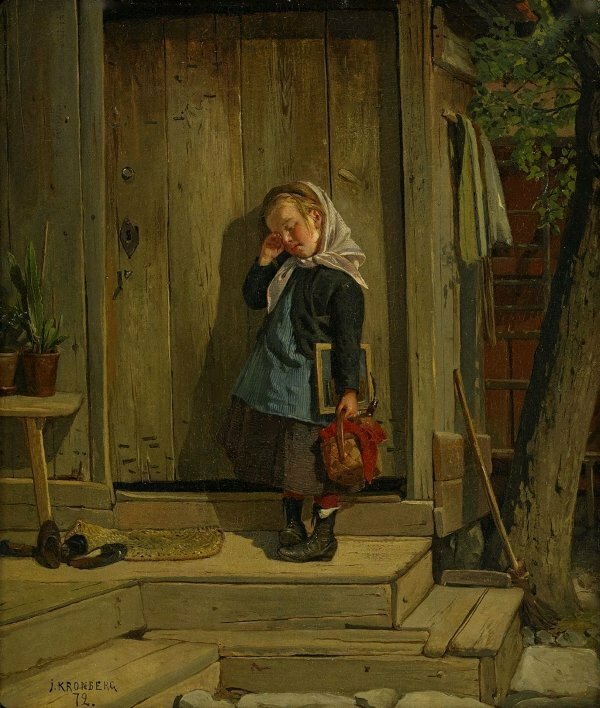 Late for School, by Julius Johann Ferdinand Kronberg, 1872. The next week she brought with her half a dozen little girls from her regular schoolroom where she was teaching during the week. 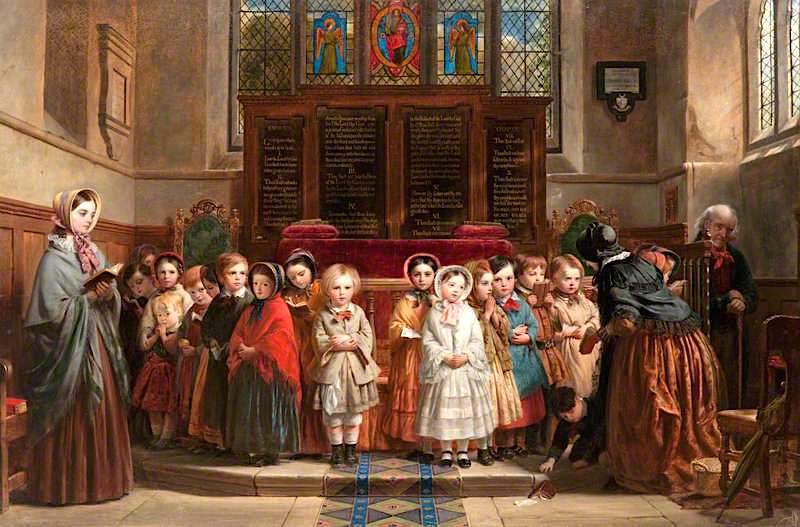 She liked to keep the opening prayer brief; just a few simple sentences which she had the children repeat after her. Then they would close with the Lord’s Prayer in concert. They lose not their reward. And one little heart to love him still. She always selected a verse for the children to memorize. She read the verse with her students aloud and reread it until the bright ones could repeat it from memory; then she talked about the verse with her class, and stressed the importance of reciting the verse correctly. The following week, she used that verse as the foundation for her lesson. Her “talk” was, in reality, a story. She used illustrations from little ones’ home, school and playground experiences to build a relatable story. Then, when she reached the point of the story when the lesson was to be revealed, she let her class bring in the verse they had learned the week before. 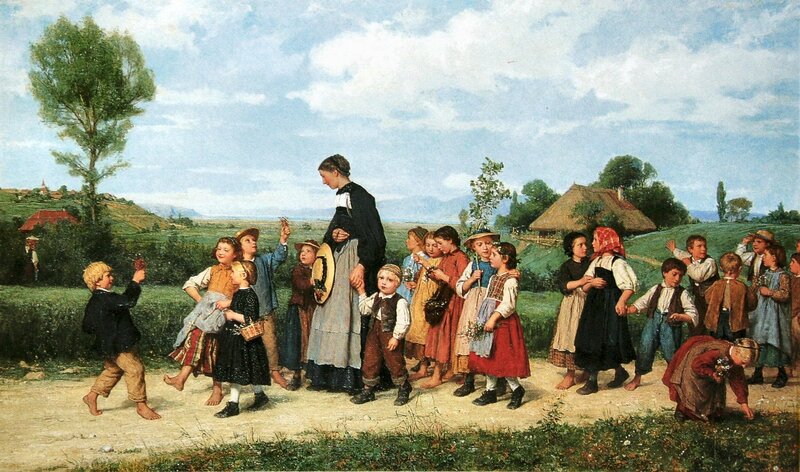 The school Walk by Albert Anker, 1872. When it was time to close the lesson it was her preference that no books or pictures should be distributed. She did not even like to close with singing unless she found a hymn that had a clear connection with the lesson. Isabella used the same method in crafting her stories for young people and adults. She chose a Bible verse and a lesson or theme she wanted to communicate about a specific verse, and wove a story around it. It was a process that served her well for the one-hundred-plus novels she wrote in her lifetime! 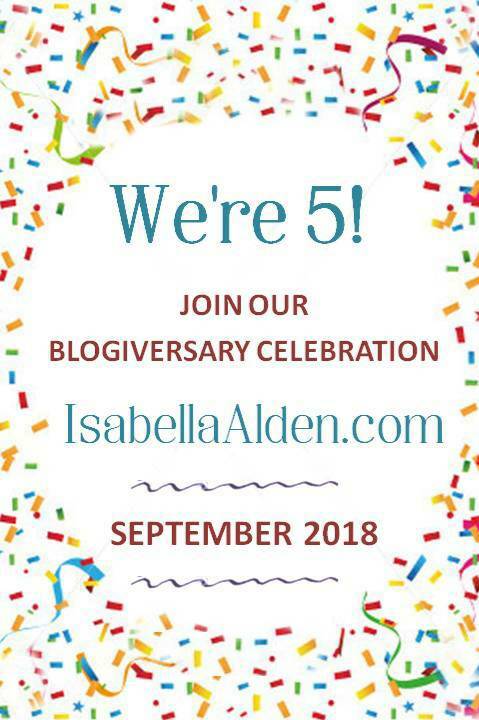 This post is part of our Blogiversary Celebration! Leave a comment below or on Isabella’s Facebook page to be entered in a drawing for a $25 Amazon gift card! We’ll announce the winner on Friday, September 14! Reviews and giveaways for Christian fiction and sweet, clean fiction. Bringing readers information on great stories and connecting authors with their readers.